squash of the season, originally uploaded by jahansell. I'm still here, but have been so focused on my Cornwall project the blog has had to take a back seat for a few weeks. Once I finish it I'll have a LOT more great Cornwall pictures to post! Meanwhile, I stopped in at Paley's for some peaches and saw the first squash of the year! Just how big are these. ot a fodd we get in such vast quantites here. Such a shame. I never did understand the difference between squash and pumpkin. Sometimes they even look the same. What fabulous colours! Really Autumnal. Goodness - they're enormous. 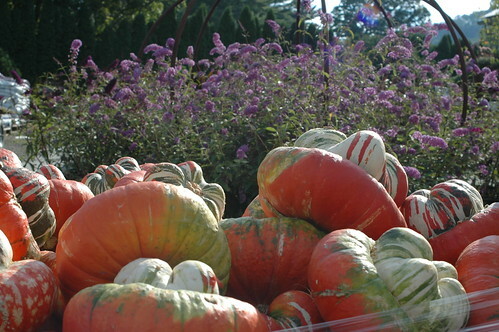 In response to Abe, we would call them pumpkins I think.